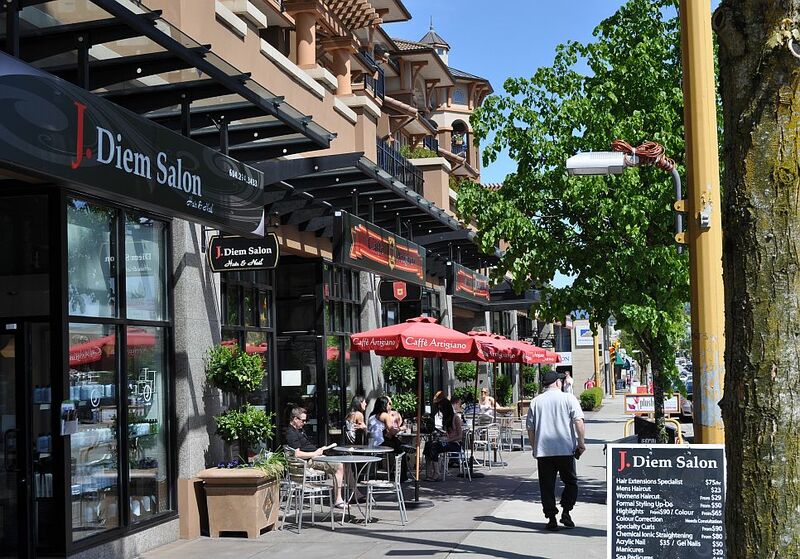 The Heights village in Burnaby grew up along a streetcar line that was built during the Canadian land boom and crash of 1911-1912. Great history, and some great little shops, some dating from the Italian immigration of the 1940s and 50s. I’m sure people have fond memories of this place; I feel regret in producing reasons why it doesn’t seem to work as well as it could. The nature of the building fronts is patchy, with a few moderately brutal 1970s and 1980s blocks. 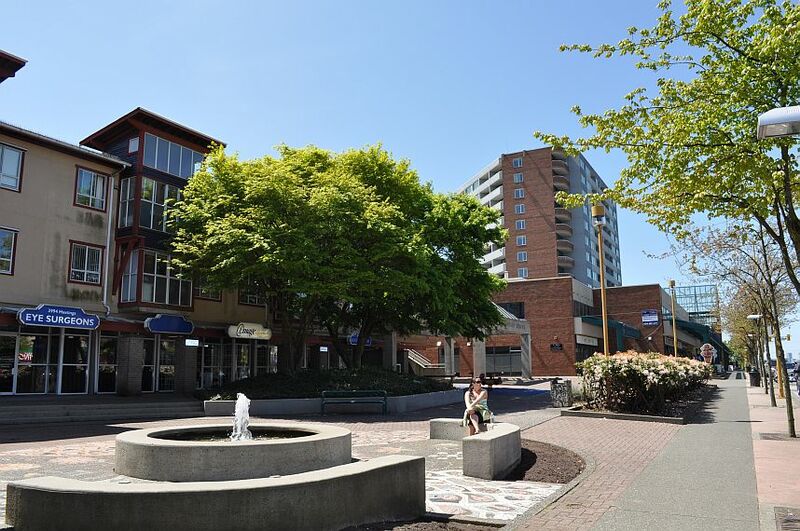 The City of Burnaby revised and strengthened its plan for the section of Hastings Street between Boundary to Willingdon in 1992. The village designation was extended four blocks to the east in 2008. The key principle is to encourage mixed-use development on Hastings, with housing up and retail down. 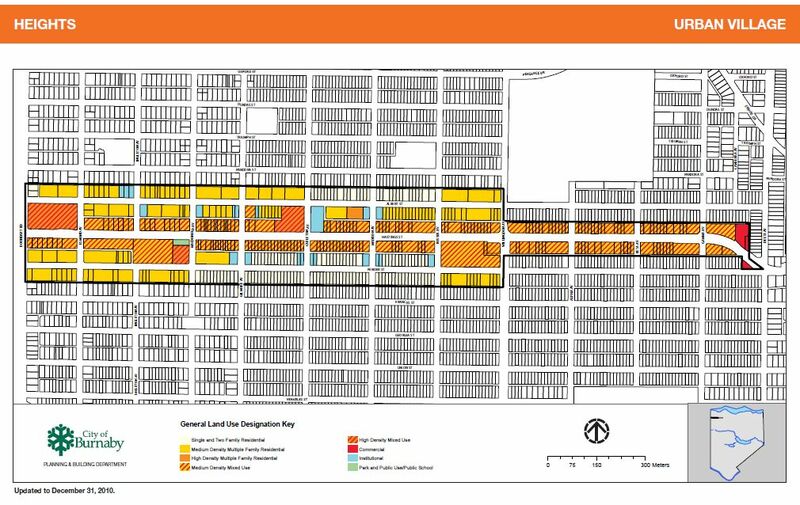 But one street does not a village make; Albert Street, one block north, is part of the village plan, and it offers some housing choices, and there is a fine library and recreation centre close by, but otherwise the area streets seem frozen in single-family detached mode. And to make it more un-villagey, the City has laid on a huge amount of free parking, chopping out the sidewalk boulevards on many cross streets to and paving over residential properties. The Business Improvement Area website, which is well done, boasts about all the free parking. What we saw was shoppers leaving their cars, walking fifty metres to pick up what they wanted, and returning to their cars. Early on a Saturday afternoon, a fine, warm, sunny day (following my post about Vancouver’s terrible weather) the sidewalks were very quiet. The Italian barber stood in his sunny doorway and looked sad. Very few people, on this day at least, were out exploring the village. 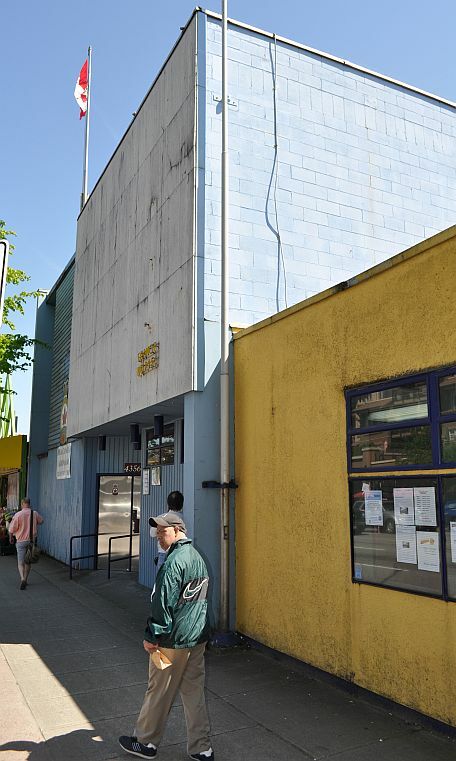 There’s already too much traffic on Hastings Street, which functions as a highway between the Tri-Cities and Vancouver; the E-Z parking regime can only add to the traffic load as well as eating up useable land. My co-tourist was my sister Morna McLeod, who has lived in East Vancouver for many years. Functionally, the village extends for three blocks into Vancouver, and the Kootenay Loop on the Vancouver side feeds buses into Burnaby. We ate at a Burnaby-side diner called The Egg and I, unfortunately named, not part of the American chain, limited menu, but surprisingly good. It makes one wonder what changes will happen on Hastings when the Evergreen Line is finished. Taking the train will actually be faster for many commuters, so Burnaby Heights and Hastings Sunrise in Vancouver will hopefully see substantially less of the Barnet Highway through traffic, and that will help to make the pedestrian realm more pleasant. 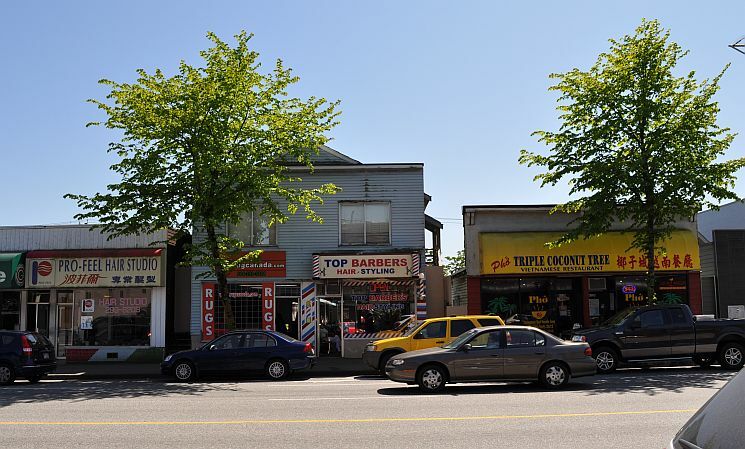 I wonder how often commuters from the Tri-Cities stop to patronize the business along Hastings, or whether most of them just contribute the nuisance of their traffic and patronize the strip malls closer to home. Thanks for the comment, Ben. I’ll assume that you’re Ben Colli of East Vancouver, author, randonneur and beer enthusiast (sloppygourmand.com). I imagined a Fraseropolis brewery tour in one of my early posts on this site, and enjoyed your beer posts as I looked at them just now. I support the Evergreen Line (with the caveat that it tends to generate towers rather than villages – see my recent post with comments by Stephen Rees) but I don’t believe it will reduce private vehicle traffic through the Barnet-Hastings corridor. The Barnet-Hastings offers an appealing alternative to the freeway even for uber-suburban mugs like me, and for anyone west of Coquitlam Centre it’s a no-brainer. Some folks will jump on the train when it starts to run, but other drivers will fill the available road capacity. The only remedies I see for The Heights and East Van are 1) implement further tactics to slow the traffic and 2) expect that in the course of things the rising price of fuel will weed out those discretionary car trips. If you can think of anything else, let us know, and drop by any time. So, 4 years later, how’s it shaping up? Thanks for the query. I will put it on my list of places to see and report back via a blog update.